Welcome to St. John of Rochester Church! *Offer opportunities for life-long Faith Formation through the R.C.I.A. Process, Adult Bible Studies, Men's and Women's Retreats, Parish Missions, Religious Education, Vacation Bible School, Middle School and High School Youth Groups. *Engage with others through Stephen Ministry, Social Ministry, Men's Club, Boy/Girl Scouts, CYO Basketball, Knight of Columbus and many other parish organizations. Invest your Time, Talent and Treasure with us. We would love to get to know you and your family as Christ's Disciples at SJR. In June of 1962 Bishop James E. Kearney formally established the parish of St. John of Rochester to be located in the town of Perinton. The patron saint of the new parish was to be St. John Fisher, Bishop and Martyr. He was the bishop of Rochester, England under the reign of King Henry the Eighth. Bishop Fisher always signed his pastoral letters to his flock, "John of Rochester." Hence the name of the new parish. When the Rev. John Le Veque set up his rectory in a ranch house on Littlebrook Drive, he contacted the Catholics of the area in the summer of 1962 and the new St. John of Rochester Parish was born. He held Mass for his new flock in the small chapel at Bushnell's Basin. The chapel, donated by St. Louis Pittsford parish, was cleaned and painted by a group of those founding parishioners that summer. From then until September 1963, parishioners attended Mass at the tiny, 50-seat chapel, often standing in the doorway or under the windows because of the crowded conditions. On September 15, 1963, Fr. Le Veque proudly opened the new combined school and church building, designed by James H. Johnston and built on land at Route 31 and Wickford Way acquired from the Indian Valley tract. The school which opened in 1963 was staffed until 1972 by the Sisters of Mercy, who set up their convent in a residence at 10 Oakwood Lane. When Fr. Le Veque died suddenly in 1968, Rev. Vincent Collins became the second pastor of St. John of Rochester. During his tenure the Parish Center on Ayrault Road was acquired from Assumption parish, and the first Parish Council was elected. Following Fr. Collins' death in 1980, Rev. Bernard Dollen became the third pastor of St. John of Rochester parish on June 28, 1980. Within three months after arriving, Father Dollen launched the drive which resulted in the new Church building which was dedicated by Bishop Clark on October 31, 1983. He served until 1990 when Father Robert MacNamara was designated as pastor. Father McNamara served as pastor for two years from 1990 - 1992. Fr. James Boyle was appointed as pastor in June 1992 and served for 15 years. He retired in June 2007. Our present pastor, Father Peter Clifford, was appointed in June 2007. 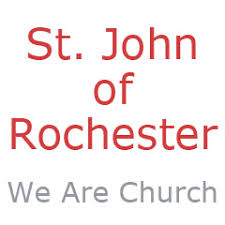 St. John of Rochester Parish was established in June 1962 by James E. Kearney, Bishop of the Rochester Diocese. In 1935, prior to being elevated to the Bishop’s seat, he had attended the canonization of St. John Fisher in Rome. Fisher had been the Bishop of Rochester, England, during the 16th century, having been appointed to that office during the reign of King Henry VII, the father of Henry VIII. In 1961, Pope John XXIII, at Bishop Kearney’s request, named John Fisher as the Patron of the Rochester Diocese. In 1962, after having previously purchased 11 ½ acres of farm land from Basil Savard, Kearney established a new parish called St. John of Rochester. The parish was given that name because John Fisher, Bishop and Martyr of Rochester, England, always signed his pastoral letters, “John of Rochester” (in Latin, Jo. Roffensis). Further, it would distinguish the new parish from its neighbor, St. John Fisher College. In October 1962 the new parish of St. John of Rochester broke ground for a combination School-Church building which still exists, but in an altered and enlarged form. In 1988-1989 a basketball court, a kitchen and four meeting rooms were added. Today the building serves multiple purposes and is known as the Parish Center. Our current Church building was built as the result of a study conducted by a Long Range Planning Committee and several sub-committees in late 1980. That study confirmed the wide-spread feeling of the parishioners that the school-church building was no longer adequate to serve our needs. Over the next two years, working with an architectural firm and other consultants, the present building was designed. Ground was broken on October 31, 1982, and on October 31, 1983 the new Church was dedicated. In February 1993, the Parish Pastoral Council approved a plan to begin the construction of an addition to the campus which would provide much-needed administrative office and meeting space. Named the Ministry Building, it houses the Parish and Staff Offices, a multi-purpose Gathering Room with fireplace, several conference rooms and storage areas. The building provides space for ministries such as Project Hunger, Prayer Shawl Ministry, Perinton Food Shelf, Stephen Ministry, Funeral Luncheons, Bible Study and other social, educational and spiritual endeavors. The Ministry Building is to the left of the main Church entrance. It was completed in March, 1995 and dedicated on April 1, 1995. Most recently in 2013, there was a full interior Church and expanded Narthex renovation project done, which also included adding a new kitchen, several restrooms, music room, and video control area. SJR continues to improve! In the 55 years of its existence the parish has had six pastors: Reverend John W. LeVeque (1962-1968), Reverend Vincent P. Collins (1968-1980), Reverend Bernard F. Dollen (1980-1990), Reverend Robert C. MacNamara (1990-1992), Reverend James E. Boyle (1992-2007) and currently Reverend Peter C. Clifford (2007- Present). During those same years we have had the services of fifteen ordained priest assistants and parochial vicars, two permanent Deacons and their spouses, and four pastoral associates who were either Sisters of St. Joseph or Sisters of Mercy. Our current Pastoral Associate, Ms. Barbara Hesenius (2000 – present) was our first lay woman Associate and in 2008 Mrs. Amy Voll, who had served as parish Director of Music since 1997, was named our Pastoral Associate for Worship.